Our ground floor Racquet Club Villa has a king in the master and 2 double beds in the guest room. We have new televisions and wifi in the villa. Harbour Town is just a short walk or bike ride away, where there are many wonderful restaurants, shopping, and the famous Harbourtown Lighthouse. You are also steps away from the Harbourtown Golf Links and Stan Smith Tennis Center. The Sea Pines Beach Club is just a short bike ride away. South Beach, which is home to the famous Salty Dog restaurant, is also nearby. The Sea Pines Trolley is also available for your transportation throughout Sea Pines. Sea Pines has many miles of beautiful bike trails at your disposal. You can swim in the neighborhood pool, play tennis on the clay courts, or sit on the patio overlooking a beautiful lagoon. 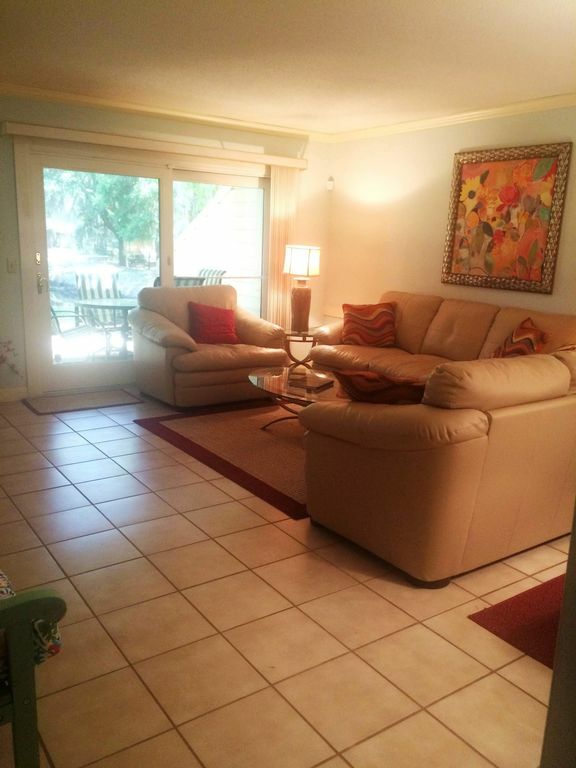 This condo was very clean and conveniently located! The complex also has a great pool. We had a great trip staying here. One thing to note that is new this year in Sea Pines, people who are not renting from Sea Pines Realty are no longer guaranteed parking at the beach club. The first 50 cars are allowed in, but after that you have to park at Plantation Club (and pay $10) and walk over or ride the golf cart shuttle. This is for the summer only. Having said that, this condo is a short 10min bike ride to the beach, but if you are a family that takes a cooler, umbrellas, chairs, etc and stays for the day, build in the $10 parking fee to your budget or plan to park before 9am. We absolutely loved Lisa's place. Super clean and very nice. Location was perfect! She was great to work with too. Always helpful and responsive. We will be back! Walkable to Harbour town and enough space to travel with teenagers. The location is great—easy walk to restaurants, shops, and bike rentals. The trolley stops basically right in front so no need to drive anywhere. The condo itself was spotless and perfect for our group of 3. The owner was also very responsive. I’d stay here again. We were two couples traveling together. Had never been in this area before, and Lisa was great to deal with and very helpful as we prepared for our trip. Other couple was unhappy with the beds, but our bedroom was fine. The perfect place for our college roommate reunion!